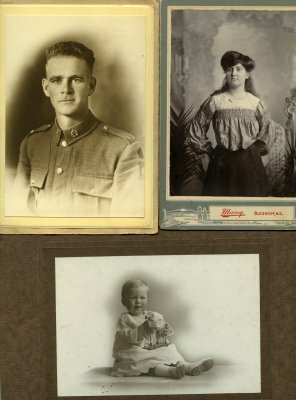 Description Selection of 7 photographs of the Smith family. 1. Mary Smith (nee Broughan), daughter of Denis Broughan & Nanny Broughan (nee Aroa), standing outside a house. 2. Studio portrait of Arthur Smith, Monica Smith and Ian Smith, children of James Smith & Mary Smith (nee Broughan), of 176 Scott Street, Blenheim. 3. Portrait of Arthur Smith, in uniform. Photograph taken by G.McCusker, Blenheim. 4. Portrait of Ian Smith, in uniform. Killed in World War 2. Photograph taken by G.McCusker, Blenheim. 5. Sepia studio portrait of Arthur Smith in uniform, mounted on cream card. 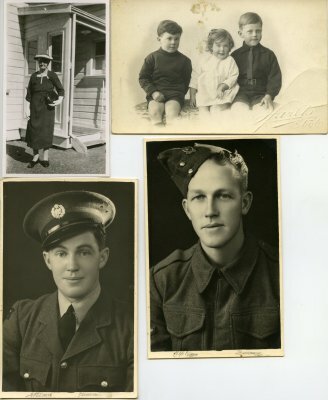 He lived with Bill and Phyl Reyburn, Whangarei. 6. Black and white studio potrait of Mary Smith (nee Broughan) as young woman, born 1885. Photograph by Macey Studio, Blenheim. 7. Sepia studio portrait of Ian Smith as a baby, seated holding toy horse.